The AzAR pronunciation trainer, a computer program for the systematic improvement of the speech recognition and speech production competences of students of foreign languages. 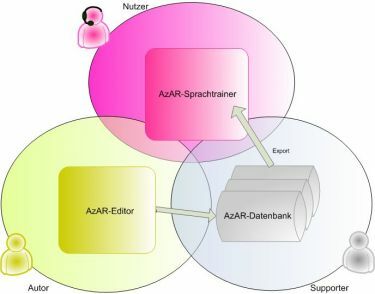 The AzAR editor, an authoring system for the development of training materials for the AzAR data base. The AzAR training units, developed by experts of the Technical University, Dresden, based on the best available scientific research data and made available through the AzAr data base. Using these core components, AzAR can be custom-tailored according to your demands. View the AzAR demo videos here.